David Dahl's clutch hit in the ninth inning. Credit: Brett Davis, USA TODAY Sports. Last night they took an “L” but tonight they bounced back. Jon Gray and the bullpen were on fire Thursday night, and the Rockies came alive in the ninth inning to comeback and win 5-3 over the Braves. 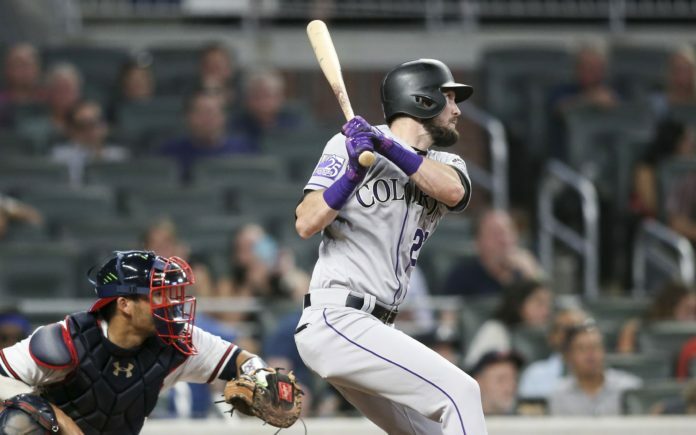 Colorado jumped out to the 1-0 lead in the second inning when Ian Desmond hit a sacrifice fly to score Nolan Arenado, but Atlanta tied it up 1-1 later that frame when Kurt Suzuki hit a home run off Gray. David Dahl followed that with a homer of his own in the third inning, to take the lead back at 2-1. Gray struggled in the fifth, giving up back-to-back doubles to Suzuki and Darby Swanson to tie it up. Julio Teheran then singled — three of the six hits the Rockies’ starter gave up on the night — and Atlanta took the 3-2 lead. They’d hold onto that advantage until the ninth inning, until Colorado went wild. Trevor Story reached on a fielding error and Gerardo Parra walked before Ryan McMahon came through clutch to with a single to score Story. That left runners on the corners, and after Chris Iannetta struck out, David Dahl singled to score Parra and McMahon for the 5-3 lead. It was a magical ninth-inning rally which put the bow on top of Gray’s superb game. He went 7.0 innings giving up five hits and three runs while striking out nine Braves and walking one. And even after Gray went out, the bullpen — Seungwan Oh and Wade Davis — didn’t allow a single run, to hold onto the dominant win. Colorado lost 12-1 to the Houston Astros on Wednesday, so, to bounce back and beat the Braves in Atlanta was huge. The Rockies improved to 65-56 on the season, still a mere 1.0 game back of the Arizona Diamondbacks in the NL West. Colorado is also only 1.5 games back of the the National League wild card. Tomorrow, the purple and black play Atlanta in Game 2 of a four-game series, with first pitch scheduled for 5:35 p.m. MST.